A step forward for surfing? Health a lot better these past couple of days. Fit and able with a shovel and pick. Slipped and fell on a cliff path yesterday afternoon, feared the worst but the neck held up. Felt a bit wobbly for a few hours but no harm done (touch wood). Just one thing annoys me: why have I still not got a date for the biopsy? Regular readers will recall that testing positive for Lyme four times is not enough to prove that I have Lyme. My neurologist, taking advice from Southampton, told me two weeks ago that a biopsy would be arranged while I still had the Lyme (or not Lyme) rash. As it happens, the rash is showing no sign of going anywhere and, if anything, seems to be slightly more livid lately. But why the delay in organising the biopsy? Surely it's in everyone's interests to nail this test as soon as possible? My incarnation as art editor for Cornwall Today magazine this evening led me to research the works of Henry Perlee Parker. This dude was around well before surfing but he was drawn to coastal themes, often portraying smugglers, fishermen and young lads eating oysters. Maybe he would have painted the Sport of Kings had it existed in his time (1795 - 1873)? Who knows. What is certain is that, in contrast to the avowal on this website, he did not favour "a loan figure" in his landscapes. Then again, maybe he did. Maybe everyone painted by Parker was lent to him? I have decided that just because it rains, it doesn't always pour. This epiphany did not come to me this morning as I lay in bed, feeling dreadful and cursing my evil fate, but as a consequence of events as the day rolled on. First, I bumped into Dave Muir and his Dad, Rob. Every local surfer in my neck of the woods (and some from beyond, too) knows these characters, for they run a very good surf school at Sennen Cove. They're fixtures on the beach from spring to late summer, and a couple of years ago Dave especially played a large part in helping my son Harry become the pretty good surfer that he is now. Aside from this, what I like about Dave and his Dad is that they're always cheerful. No clouds hovering over them, that's for sure. A little later, ill health having temporarily left me, I sat down to write. Not the usual ephemera but something dear to my heart, which I began about five years ago and revived while waiting for the op before Christmas. I haven't felt well enough to pick it up until today, but pick it up I did. It felt great. If being ill means I can crack on with this, maybe being ill isn't so bad after all. Then I drove over to St Just with Elliot to pick up Harry from Cape Cornwall School. As we left, Elliot made a reference to the quality of a certain reef near me. Those who know me will understand that potentially this was a very significant observation. I leave it at that. We picked up Harry and on the way home talked waves. Harry asked if I thought I'd ride a shortboard again when I got back into surfing, or opt for longboards for good. What I really liked about this question was the word when. As we drove back Elliot confirmed that the reef had been working. Harry swore to be in the water this weekend. The three of us plotted completing the Tour de Mont Blanc, maybe in May. "It'll be good fitness for you when you've got shot of Lyme," said the boys. I realised, as we chatted, that I was moving my neck with freedom and no pain. Harry noticed this too, as had Dave and his Dad earlier. Pretty damn good, given that 10 weeks ago I had disc whipped out. By now, the clouds weren't even drizzling. Life goes on. There's a lot to be stoked about - as witness these surfers from South Africa. If it rains, does it also pour? This question has loomed large over the past couple of days, for instead of making my way to London, for a mixture of work and the kind of once-a-year networking that is important if you freelance for the nationals and yet live only a few miles from Land's End, I was yesterday well and truly laid out by a hideous blend of nausea, tiredness and acute headaches. Rather than completing half the journey and getting as far as my parents' place in Devon, I went to bed. This morning, I got up with Karen and the boys only to spend much of the rest of it throwing up and sleeping feverishly. The afternoon was slightly better, in the sense that by then I wasn't throwing up, but I've rarely felt quite so rubbish as I did today. Is this Lyme? I have no idea. One must be wary of seeing it at every turn, especially given that a nasty gastric flu has also swept these parts lately. Either way, though, the question remains: if it rains, does it also pour? For on top of what is now a five month run of totally crap health, I'm also a casualty of the shake-up at the Times. Just about all media, but especially the national papers, are undergoing change at an extraordinary pace at present, as the recession eats into advertising revenue and everyone desperately tries to figure out how to make money out of the internet. Sooner or later, as this process plays itself out at the Times (my main source of work in the last year or so), a hit had to come my way. It came in the form of the axing of my weekly Saturday column for the Times' Weekend supplement. Entitled 'The Coaster', this appeared every weekend, bar a couple, for the whole of last year. It was, if truth be told, a great gig. I got to write about the coast for money! 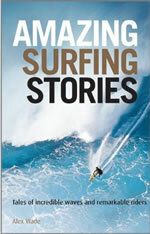 It was almost as good as getting paid to write a book about surfing (and certainly more lucrative). Alas, though, The Coaster is no more. There's simply no space for it in the new look, trimmer, more cost-effective Weekend supplement. Of course, as one door closes, another opens. I understand that there is vacancy on the local paper round. What better, if I can't write for the Times as a columnist, than to deliver it? But I jest. Successful freelancing is all about having many irons in the fire, or fingers in lots of pies, but not both at the same time, and this, the bit about the fire, I have made my motto for many years now. All will be well [You don't sound convinced. Ed.] It's just that, damn it, I really enjoyed writing The Coaster, and, with a touch of melancholy about me tonight, I can't help but think that somehow or other its demise is the inevitable consequence of spinal surgery and this bloody Lyme disease. In other words, you make your own luck - and when you're staggering about like a very, very old man, feeling like death warmed up and worried sick about your health, being lucky becomes more of a memory than a reality. Mind you, the other day I discovered a pension I'd forgotten I had. Not a vast amount by any means, but a nice little find. It was one of those contributory things - I paid half, my employer at the time paid half. I emailed the pension company asking if I could cash it out early on the grounds of serious ill health, only to be told that I couldn't, unless my GP would certify that I'd die within a year. I asked and she said "No", quite rightly, too, for despite feeling stupidly ill I plan on being around for a couple more decades at least and, medically speaking, it can no more be said, with certainty, that I will die in the next year than that QPR will evade relegation this season to League One. But just as my quest for cash seemed doomed, a voice of reason from on high (Scotland, to be precise, the home of my long lost pension company) took pity on the plight of this particular Lymish yet surgically enhanced writer and agreed to pay 25% of the pension early anyway. The view from my window today was heavenly: line after line of swell, with a decent wave interval and held up by a moderate offshore wind. Somewhere on the south coast - in fact, at lots of places on the south coast - there would be immaculate right-handers breaking for fun. Naturally, all were off limits, thus proving Ocean Attack's First Law of Surfing: that if it's any good, something will stop you surfing it. Truth is that I was gutted. I have carefully avoided being proximate to waves ever since my last surf, at the end of October 2009. Not seeing them (or, if I have done, closing my eyes) has helped me maintain my fragile grip on sanity. The fact that a certain right-hander near my house has worked but a couple of times since has helped. Today, though, there was no avoiding everything I've been missing. Yes, of course I closed my eyes but I could still hear the surf. And when I opened them again, there they were, perfect head high rights, reeling down the reef. I rolled up my sleeves and did some gardening. Image of a wave looking very similar to the one I couldn't surf today courtesy of this blog. However, what I would like to know is this: is there anyone out there who has been successfully treated for Lyme by the NHS? Despite a day or so of electric shocks, mainly in my left hand, and deep, unpleasant spinal reverberations (which I blame on a wobbly post-spinal surgery blip, rather than anything else), I have written to those who know the answers with questions about Lyme. To date, my questions have not been answered satisfactorily, or, er, at all. However, these are early days. I don't expect a prompt solution to my problems, nor even a swift answer to my emails. I am merely one of scores of patients. I recall from my days in the law how difficult it is to allocate time to deal with every client. Often enough, the ones who were imminently due in court would be prioritised. So it must be in medicine, too. Those who are on the critical list must come first. I'm not on the critical list. But I am seriously, perhaps even critically, perplexed by what's happening to me. A few days ago I discovered that someone had created a Wikipedia entry for me. I suspect this comes on the back of my Times article on health mayhem (specifically, Lyme disease). "At last!" I thought. "Now I am truly famous! I will hoist my flag as high as it can go, or maybe run through the streets with it, or perhaps wrap it around my naked body and just enjoy the flag of fame for its own sake!" But today, having entirely accidentally typed in "Alex Wade - very famous person - Wiki" into Google, I discovered that the Wiki entry kindly created by someone needs reviewing and, yet worse, that I might not, after all, be notable enough for Wikipedia inclusion. Coming on top of my many physical ailments, this could be the last straw. To think that I came so close to acheiving my lifetime ambition - being a Wikipedia entry - and yet now stand on the brink, teetering, flagless, in the wind, knowing not whether I will live to ascend the Wikipedia summit or plunge headlong back into the abyss of obscurity. That sounds good. But what about the strapline? Apologies to everyone who's emailed me lately and not received a reply. I'm now getting about 150+ emails a day, most of which are about Lyme. I'd very much like to reply to everyone but it's impossible. I do hope that my failure to respond is not taken as ingratitude - a great many emails have been both helpful and illuminating. Thanks to all - I hope to reply in due course. I was out for a walk today on Grumbla Common, an obscure patch of West Penwith but one with great views of Mount's Bay and the sea beyond the Penberth valley and Porthcurno. It struck me as strange to think that just four months ago every day of my life was defined by surfing. I knew whether there was swell, what the tide was doing, which banks were holding up, what size waves there'd be at my favourite breaks. Now, if it wasn't for the fact that I'm lucky enough to live in a house overlooking the sea, I wouldn't have a clue whether it was high or low tide. As for swell, wave quality, wind direction - these are things now only vaguely in my mind. I miss surfing, I really, really miss it. I miss the immersion in the ocean that was a major part of my life, I miss seeing the usual faces in the line-up, I miss the chat that went with every session, I even miss the frustration of having a bad surf, and definitely miss surfing with my elder son, Harry. The pair of us are off soon to check out the Bournemouth reef, this following a commission from one of the nationals. Just four months ago, we'd have surfed it together; now, Harry will paddle out and give me the lowdown. I'm relegated to spectator status. How long before I'm fit enough to surf? The neurosurgeon's advice was anything between six to eight months to a year after the op, which took place on 16 December last year. I'm two months post-surgery, so it's possible, if everything pans out nicely, that I'll be paddling out sometime in July. Right now that seems impossible. My neck hurts a lot, I have regular and annoying electric shocks in my left hand and my left leg is wonky. But the neck will settle down and I managed to get a few waves with a wonky left leg before the cervical myelopathy diagnosis. So I reckon I might be able to overcome this, if it never sorts itself out, and still surf. Unfortunately, though, my natural (delusional?) optimism is tempered by Lyme disease. I'm frustrated by the lack of progress on this. Everything adds up to me having Lyme - four positive blood tests and the classic erythema migrans rash. My symptoms - horrible fatigue, blinding headaches, intolerance to unexpected sound - come and go but they're consistent with Lyme, too. As is last night's latest development - inexplicable, biting pain at the top of my right shin. It was so bad that I couldn't sleep and it troubled me for the morning, too. I understand that Lyme can cause joint pain; certainly, having done nothing but walk the dogs for months, I'm not suffering from a shin splint. There's nothing to do but plod on and wait. The picture, by Ben Jones, is of Harry surfing in Portugal. I wonder if he'll score waves like this when we're in Bournemouth?